Look what arrived in the mail Friday afternoon! Labels! I ordered some custom made cotton tape to be used as labels from Lilla Lotta. This Etsy store has wonderful quality cotton tape/ribbon which Anna from Lilla Lotta, is happy to customize to your needs. I can highly recommend Lilla Lotta, Anna's communication was excellent, the service was speedy and a top quality custom product. I immediately put the labels to good use. (I am notoriously lazy when it comes to labeling quilts!). I have finished the three baby quilts, label and all! The quilts are all the same size, measuring 25.5 inches x 35 inches. Baby quilts One and Three have the same binding, a green Micheal Miller dot called Heuvos. The backing of both these quilts is a lovely soft pastel blue monkey flannel fabric. 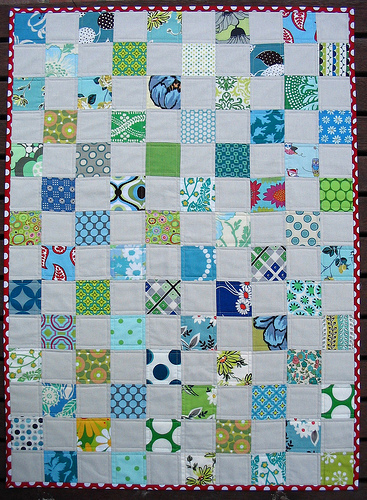 Baby Quilt two has a Red binding with White polka dots. The backing is also a Sock M0nkey fabric, but this time just a cotton fabric. All three quilts have a top quality natural cotton batting by Matilda's Own. These baby quilts have been added to my Etsy store or feel free email me if you would like more details. Thanks for the tip on the labels! Those quilts are super cute. Those labels are a really good idea, I am going to pop over and see what I may need! 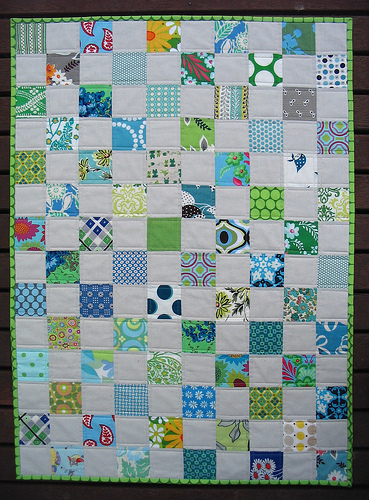 Love your baby quilts too, hope they sell fast for you. The baby quilts are adorable. I like the labels like that... I'm definitely getting them in white next time I order mine! Your labels are really smart and the quilts are just divine. Well done! I'll have to check out those labels - they look great! Cute, cute, cute again. The money fabric is perfect for those!! love it! i never thought of using tape in the binding like that instead of a label! I'm off to check out Lila Lotta!! 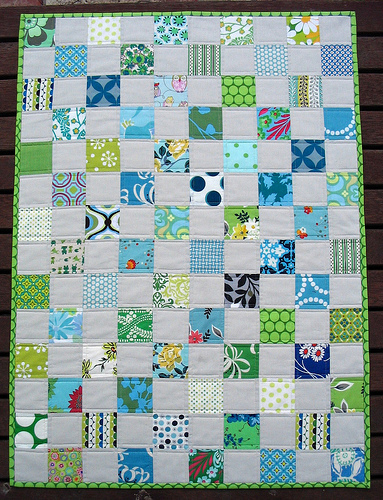 Beautiful Baby Quilts...also love the backing...Good Luck with them on Etsy..
Wow! Those baby quilts are just adorable. I love the label touch too! Great job getting all that binding done! As usual, they look wonderful. These are adorable and those sock monkeys are too cute. Love the labels Rita but the backing on the quilts is perfect - what fun the owners will have with them! Gorgeous as usual! I particularly love the red binding - it really makes the colours of the quilt ping. Ah, your timing! Was just thinking I needed more labels in my life (I'd label everything if I could). 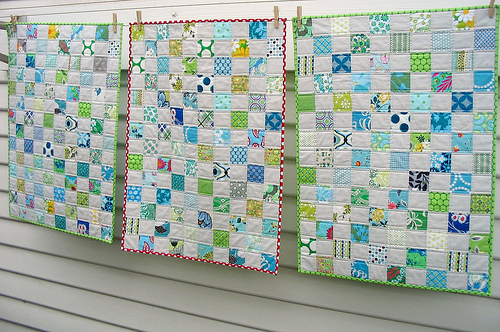 Love those baby quilts! I've been wanting tags for some time, thanks for the link, I just e-mailed her! Thank you for the tip, I've just ordered some for myself. They look great. Your quilts are amazing, I'm sure they will sell very quickly! 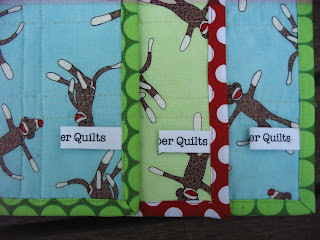 These quilts are are adorable and the labels/tape thingy is awesome! These are so simple and so beautiful - congratulations! Love the labels too. The labels look excellent, and they really finish the quilts well. I have just started my blogging adventures and am learning so much! Thanks for the tips. I am also thinking of putting the same kind of labels. The quilt I'm working on for a friend who has been diagnosed with breast cancer, the label will be there. Btw - I have just put your blog in my google reader. Wonder why I have not found you earlier.